When you think about all the bathrooms in your home, which one gets used the most? Most likely it’s the small powder room on the main floor. While it doesn’t have a shower or bath, it’s proximity to living space means its used by both family members and guests. The powder room, however, is often overlooked. It’s small, doesn’t have a lot to offer, and is more function than form. But it can actually be the star of your home. Small spaces tend to have the most neutral of colors, but what if you were to go the opposite way? Try a bold color, like deep raspberry or cobalt blue. Or, alternately, try wallpaper with a funky pattern. The other fixtures, like the toilet and vanity, will be neutral, so they will offset the bold walls. While many people try to match the powder room with the rest of the main floor’s décor, this doesn’t really have to be. Most often the door remains closed, so the wall colors won’t intrude on the rest of the area. With a powder room, you can invest in higher quality fixtures because there are so few of them. The bathroom taps can have a nice, sleek style. Make sure your towel rack and paper holder match. And for all your metal fixtures, stick to one style. Choose either a shiny chrome or a burnished nickel. There’s not enough room to mix and match the finishes. One of the easiest ways to conserve water is with a low-flow toilet. Purchase one that meets your budget, but that will also help save you on water usage. It’s a great way for family members to become aware of the water that is used for everyday tasks. It’s also a nice reminder for guests that stop by, and might even inspire them to make more environmentally friendly home purchases. There’s nothing worse than running out of a towel while in the powder room, or worse, toilet paper. But a bit of well placed storage can help with that. 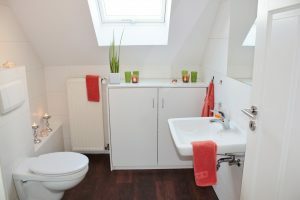 Most powder rooms are small, which limits the amount of space. And, if you have a pedestal sink, then there won’t be any built-in storage. Time to be creative. Narrow baskets that fit between the sink and the wall can slide in and hold a number of items. Shelves on the wall can hold smaller objects, such as soap and hand towels. You don’t have to be limited by what is already in place. Instead, you can get creative and make the space work for you.